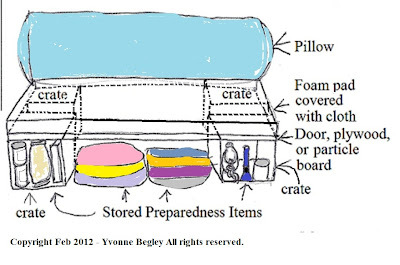 If you are really serious about getting lots of storage for your emergency preparedness there are some ways to do it. The one that takes the most commitment is making a new floor that is on top of your existing one and using the space between them to store your emergency preparedness essentials. There are a lot of problems that come up with this storage solution, like tall people hitting their head on lamps and being able to open doors, etc. You can pick one area and only raise the floor in that area, to start with. I think a living room area is one that works ok that way. If you have carpentry skills, you can do it that way, or if you don't know much about carpentry or you only want a temporary arrangement, you can use storage crates or cinder blocks to hold up your raised floor. I got old doors for free to use for my raised floor. If you can not find old doors, you can use plywood or particle board. If your old doors are hollow core, you will probably have to use plywood or particle board anyway, because recently made hollow core doors are paper thin and won't hold much weight. If you need to do this on a very low budget, you can start by making your living room furniture or beds from crates or cinder blocks with plywood or doors on top of them. You can store a lot under a bed. I used mine like a day bed, so it was a couch during the day. I put it against the wall and made large pillows that leaned against the wall. I used doors for a desk as well and put boards from a fence above it for shelves. My cats liked to sleep and play up there as well, so it also served as a cat playground. You can use crates and fence board and doors for more shelves to hold books and disaster preparedness supplies. If you have enough money and doors or boards to do the whole thing at once, you can do a sort of conversation pit with storage benches around it. You can cover foam cushions for seats and put pillows on them for backs. 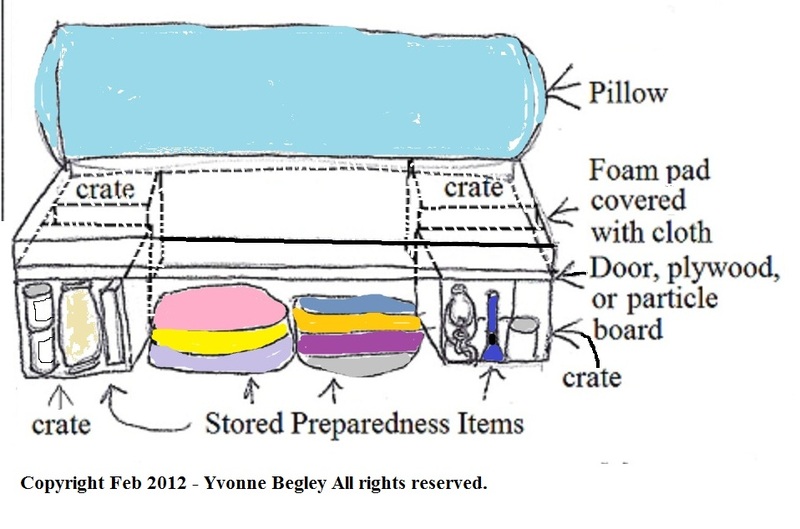 Home made couch with storage for emergency preparedness supplies. I made a skirt to go around the bottom of the couch so that the things underneath would not show and it will look nicer. It is also better that not everyone know that you are prepared for emergencies so you don't have someone wanting to rob you during a disaster. Looting during disasters is common and the efforts of law enforcement to keep order are often overwhelmed. Keeping a low profile is much safer and less distressing.